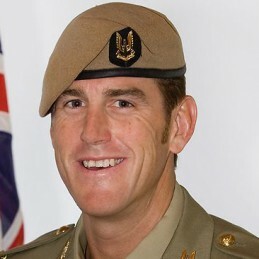 Ben Roberts-Smith VC, MG is a former Australian soldier and a recipient of the Victoria Cross for Australia, the highest award in the Australian honours system. At the time, his Victoria Cross, together with his Medal for Gallantry (awarded for actions during a tour of Afghanistan in 2006), made Roberts-Smith the most highly decorated member of the Australia Defence Force. During his fifth tour of Afghanistan, on 11 June 2010 Roberts-Smith was involved in an operation to hunt for a senior Taliban commander in the Kandahar province. Here he took part in an assault against an enemy fortification exposing his own position in order to draw fire away from members of his patrol who were pinned down. Fighting at close range, he stormed two enemy machine-gun posts and silenced them. For this action Roberts-Smith was awarded a Victoria Cross. His citation in the Commonwealth of Australia Gazette noted that ‘his selfless actions in circumstances of great peril served to enable his patrol to break into the enemy’s defences and to regain the initiative … resulting in a tactical victory’. Following his sixth tour of Afghanistan in 2012 Roberts-Smith was further recognised with a Commendation for Distinguished Service for exceptional leadership, courage, mentoring, and reconnaissance in the ‘most difficult and dangerous of circumstances’. Highly motivated and proactive with a commitment to excellence and continuous improvement, Ben has the ability to manage, lead by example and motivate high-performing and diverse teams to respond effectively to complex and high-pressure situations. Ben founded RS Group Australia Pty Ltd in 2011. Ben’s background as an elite professional Special Forces soldier with 17 years of strategic and operational experience in domestic and international environments is unique in the corporate consulting market.